Each month when National Geographic arrived in our mailbox, I would sit on our couch after school and pore over every story looking for Jodi Cobb’s name. 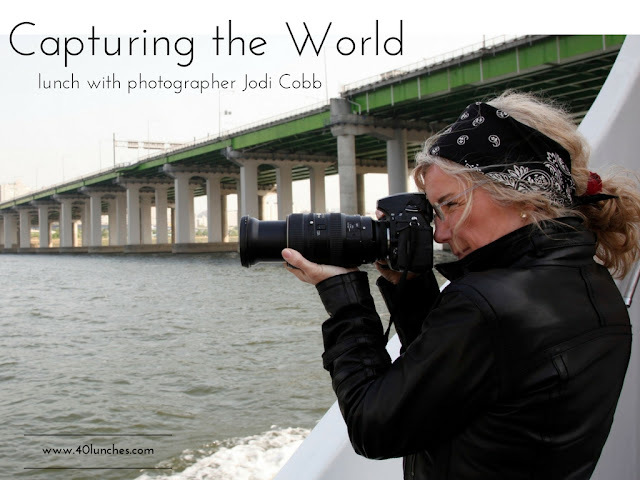 One of the first female photographers for National Geographic, Jodi’s photographs explore the human condition and capture secret worlds, worlds that I was mesmerized by as a child. Jodi was my hero. Heroes play an important role in our lives. They encourage us to transform ourselves for the better. Our heroes provide us with a reflection of who we are and who we aspire to be, often serving as a moral compass. Their accomplishments and what they stand for provide both inspiration and direction. They introduce us to possibility, nourish our hopes, and affirm our most cherished values. Specializing in long-form photojournalism, Jodi has repeatedly put herself in harm’s way while in search of the perfect, most honest photograph. With a career that spans four decades, much of her work focuses on human rights issues and the condition of women around the world. 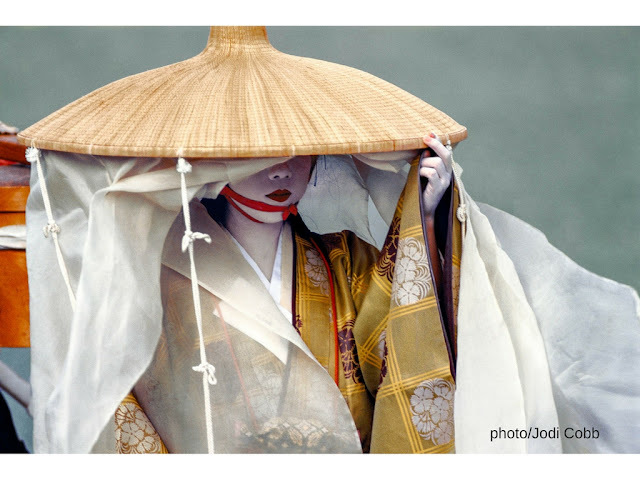 Through her work she gained unprecedented access to the Geisha women of Japan, which resulted in a Pulitzer-nominated book, as well as the sheltered lives of the women of Saudi Arabia. She sought to explore the definition of beauty as defined by cultures around the world and documented 21st Century slavery by exposing the harsh realities of human trafficking. Jodi was introduced to other cultures at an early age. Her father’s work in the oil business took them all over the world giving her an early taste for travel and an acute understanding of just how big the world really is. By the time she was 12 she had been around the world twice. When her family finally returned to the States, Jodi found herself trying to explain to others what the world was like, a mission that fueled her career as a photojournalist. After high school, Jodi went on to earn a degree in journalism from the University of Missouri and returned for a master’s degree in photojournalism. Her work – and her perseverance – quickly earned the attention of National Geographic. The world of photojournalism was very male-dominated at the time, but Jodi was determined to prove herself. Her persistence paid off: she was the first woman to be named White House Photographer of the Year. For the past two years, Jodi has been hidden away in her attic compiling her retrospective, a book that will feature photographs from her career. It’s a daunting task: forty years of photographs must be narrowed down to the 500 that best represent her work. Loyal to film, Jodi only started shooting digitally around 10 years ago, making the process tedious. But the effort will be worthwhile: by telling the stories of these underrepresented communities, she is also telling her own story; it is the story of her own life in pictures. Even though her work takes her away for months at a time, she has made DC her home. We meet at a busy restaurant that affords us a view of the water and the Kennedy Center. My daughter is with me for this lunch armed with her own questions and insights about Jodi’s work. Jodi is patient as she listens to a six-year-old's reflections on her work. We are related in a way that only Southern people take the time to keep track of; my grandmother and her father are first cousins. We are from branches of the family far enough removed from one another that our paths have never crossed. There are so many questions I want to ask and she knows it. She brushes them off saying she wants to know more about me. We exchange stories and family folklore. As we talk I see hints of my mother and her cousins in Jodi’s face: the eyes, the smile. The relationship might be distant, but the genes are strong. As lunch comes to an end I thank her for being a great role model and for introducing me to a world filled with possibilities. There’s a great lesson to be learned in revisiting our past and reflecting on who our own heroes are and what they represent for us. It also serves as a reminder that there may be people watching us from afar and we may never know the impact we have on their lives. When we return home I go back to teaching and driving carpool. On our way to swim practice one afternoon I hear my daughter in the backseat, explaining to two friends that there are places in the world where women wear gold rings around their necks to protect them from lions and tigers. She knows this to be true, she assures them, because a photographer told her about them and there are pictures to prove it. It’s a story she heard from Jodi, whose work continues to inspire the next generation of young women. If you have enjoyed this post, please check out other posts on the 40 Lunches Project. You can follow along on Facebook and Twitter.